It’s unusual to fly to Salzburg via Vancouver, but it’s not quite as crazy as it seems. Air Canada is the new hot airline if you’re looking for affordable tickets to Europe from the West Coast of the U.S. As a frequent flyer on a budget, I am constantly on the lookout for good deals. And this is already the second time this year that Air Canada has been able to offer me a better price from L.A. to London than any other airline. The in-flight experience is quite pleasant, as all of the Air Canada planes I’ve flown have been in mint condition. The food is nothing to blog home about, but the service is very efficient. Individual entertainment screens offer a wide selection of films from Hollywood and Paris. There is also an extensive audio library; they do not have a dedicated opera radio channel, but they do include several classical albums, including a complete recording of Schubert’s Winterreise! I wish other airlines would feature German Lieder. I’m not sure if “Der stürmische Morgen” is what you want to hear at 30,000 feet if you’re already experiencing turbulence, but it’s still nice to have the option. What makes an airline “opera friendly?” Its radio selections, or the fact that it offers affordable fares? Air Canada scores well on both counts, making it a great choice for traveling singers on a budget. The international lounge at YVR is an oasis of blue and green. They have done a nice job with the British Columbian theme: I enjoyed gazing at totem poles while I was on the people mover, and crossing a log bridge on my way to passport control. I was pleasantly surprised to find an enormous fish tank near the Arrivals/Departures Monitor, and a pottery exhibit at my gate. These little details make a long layover a bit more fun. The airport offers free public wi-fi and well-placed electrical outlets, so that you can check your email, recharge your phone or even update your blog! Fast food is available, from Pizza Hut to Subway, and there’s Hanami for sushi-on-the-go. But if you’re not in a big rush, I recommend Milestone’s — they have a flat bread plate with delicious goat cheese and cranberries and a short stack of fresh hot naan! Duty free shoppers will enjoy the wide selection of perfume, makeup and gourmet chocolate. 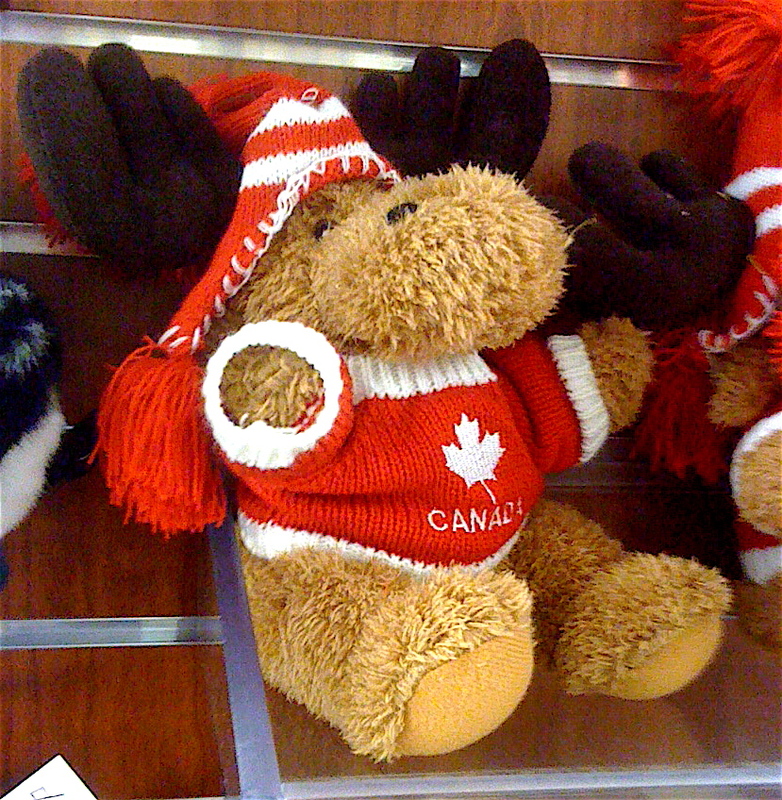 There are also some fun touristy shops to explore, even if you’re not in the market for a stuffed moose wearing a knit sweater. And if you are, so much the better. This entry was posted in Airports & Airlines, All Travel Stories, Canada and tagged airlines, Canada, Vancouver by Lindsay Westra. Bookmark the permalink.